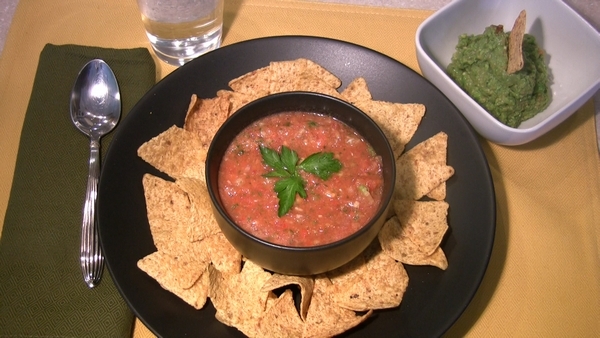 Gazpacho, a cold tomato-based soup, and this low calorie guacamole with corn chips, make a light, summertime lunch. Put all ingredients into a food processor or blender and process until nearly pureed. (Blend the soup in two or three batches if it doesn’t all fit.) Or, for a more chunky soup, hold some onion, cucumber, bell pepper and celery aside and stir in after it has been pureed. Place in non-metal, non-reactive storage container, cover tightly and refrigerate for a few hours or overnight to allow flavors to blend. In a food processor or blender, pulse all of the ingredients until blended. Serve with corn chips. Thank you to The Cancer Project for the inspiration for the Guacamole and Peas recipe.